Special Containment Procedures: The Foundation has influenced North Carolina state regulators to close SCP-2627 indefinitely for repairs. Surveillance equipment constantly monitors SCP-2627 and MTF Pi-9 ("Beach Combers") maintains a presence on both sides of SCP-2627 to prevent unauthorized access. Description: SCP-2627 is an anomalous boardwalk entrance on Ocracoke Island, NC, USA. 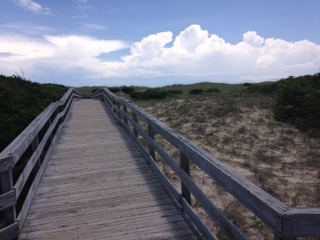 Between 0017 and 0023 hours, local time, traversing SCP-2627 by foot leads to a version of Ocracoke Island lacking any artificial structures, excepting an extensive network of intersecting boardwalks. The boardwalks cover the island1 and extend up to 1.7 kilometers into the surrounding ocean. A single boardwalk extends from Silver Lake harbor to the mainland, where it connects to a similar system of boardwalks, covered bridges, elevated walkways, and mining tunnels. Long-distance drone exploration reveals no region of North America that is not covered by this network. No signs of animal life have been found in explored areas, despite the presence of plant and fungal species dependent on animals. Any animal tissue not on one of the walkways when SCP-2627 activates vanishes permanently. There are no exits from the boardwalk system other than the counterpart to SCP-2627, which leads to a small sand dune when SCP-2627 is inactive. 1. With an average separation of 37 meters.